This page provides a brief overview of the common media used in pictures shown on this web site. Oil. This media is the classical one used by artists who pretend to high quality. It ensures that a picture might last several hundred years without significant degradation. Even if the varnish which is traditionally used as a final protection on the surface becomes dirty, faded or damaged with age, it can be renewed with care - although often pictures are now over enthusiastically cleaned so as to give them a false "as new" look. The thickness of the paint itself helps to preserve the picture and make it easier to repair (ie. retouch). Oil paint is based on pigments dissolved in a natural oil binder and in the past painters often made up the paints as necessary, although in the last one hundred years they tend to be ready made by artists suppliers. The paint is applied to a canvas or board surface, which can require time consuming preparation. This media has the advantage that as the paint takes time to dry out, it can easily be removed and reworked if necessary. However that also makes it a slow process as the paint has to dry for some time before additional coats can be applied. The result is that this technique is typically used in a studio and as the painter may be working on several canvases at once, a lack of spontaneity results. Also the extended time scale and expensive materials means that such pictures were always expensive to produce. Oil paintings are typically higher priced than those in other media. Oil painting can not just use solid pigments, but also transparent binders and pigments to create what are called "glazes". For example J.M.W.Turner often used multiple glazes in layers to give depth and subtlety to his pictures. Watercolour. This media depends on the pigment simply being dissolved in water and typically applied to a paper surface. The image presented tends to depend on the reflection of light from the white paper surface showing through the paint, instead of the reflection from the dense paint surface as in oil paintings. You can see that therefore the amount of paint and pigment used in watercolour paintings is much less than in oil paintings. Hence they are much cheaper to use. Also the small paint quantities and water base make them quicker to apply and more portable, so they can be easily used on the spot to paint landscape scenes. For the same reason, they are often used to do simple sketches which are worked up into more substantial paintings back in the studio. The quick drying of watercolour makes than fast to use, but also means that there is little room for error when painting so skill and experience is just as important when using this media. The paper surface can also cause problems with watercolours, particularly if the paper was originally not of very good quality. For example it can darken with age. If watercolours become damp, then dark fungus spots can appear (called "foxing"). These problems can be tackled by a good picture restorer. Note that watercolours should generally be framed under glass to protect the surface from atmospheric dirt, and this can exacerbate the problem of damp if the pictures are not kept in a dry atmosphere. Watercolours really became popular as an "original" medium rather than a sketching material in the Victorian age in England. The demand by the new middle class for original art at reasonable prices could not be met by traditional oil based painting so hundreds of artists catering for this market appeared. Some watercolours have patches of opaque paint, particularly white, where it is used to highlight parts of the subject. This is known as body colour. Gouache. This is basically a water based medium but the pigment is thickened with gum or other materials to make the paint opaque. The resulting pictures tend to look like watercolours because the paint is used with a similar technique as in watercolours. Pastel. In this medium, the pigment is held in a solid binder formed into a "crayon" or "stick". Obviously it is impossible to mix the colours on a palette or on the painting surface in the same way as is done in oil or watercolour pictures, so the painting surface tends to be built up by applying different colours in a hatching or drawing technique. The result is a high thickness of paint which is long lasting, and with a brightness of hue due to the high density of pigment. Acrylic. This medium is the most modern. It has many technical advantages over both oils and watercolours, although in practise it can be used in the same way as either of those techniques. For example it can be mixed and applied in heavy layers or even with a palette knife as with oils, but is quicker drying. It can also be diluted with water and hence used in the same way as watercolours. However it is not yet commonly used for more traditional subjects, even though the technical properties and life of the material may be superior. The thin layer of paint on watercolour paintings does cause a number of problems over time. For example fading is a common fault that appears and watercolours should never be hung in direct sunlight. Fading is particularly common in certain pigments, especially greens and blues, so older landscape paintings tend to look much "browner" than the artist envisaged as the greens have faded leaving the brown hues. This is not necessarily unpleasant and a small amount of fading does not significantly affect the value of the picture. Some pigments also change colour over time (as they do in oil paintings also of course over a longer time). 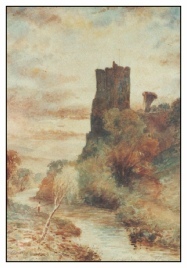 An example of a picture badly affected by fading is shown on the left (this is a work by William Woolard painted in about 1900 and entitled "Roslin Castle").